Use our Crimp Beads when connecting Clasps to Stringing Material such as Beadalon Wire, Tiger Tail, and Griffin Flexible Wire, for a professionally finished look. Simply loop the Wire through the Crimp Beads or Crimp Tubes and use any of our quality made Crimping Pliers to flatten the Crimp for a solid, non-slip connection. 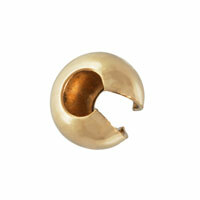 To get that truly professional look, try closing one of our Crimp Bead Covers over the Crimp Bead. It's easy and it looks so good!